I started working with ColdFusion around 1998-9. Since that time my primary interests have been (1) database queries and how they can be optimized, and (2) keyword searches. I’ll consider the latter in this post. When CF9 was first released I was skeptical of making the upgrade (and it is an upgrade, as I can see in hindsight) from Verity to Solr. While Adobe had implied, at the time, that support for Verity might be dropped in the future, it was not entirely clear that anything would be gained from the change. The tags used (<CFINDEX> and <CFSEARCH>) were the same, while the syntax was slightly different (to search the title field, one used “title:” instead of “<CF_TITLE>” in the search criteria). However, there were supposed to be significant speed gains, so I pushed for my company to make the switch. Two problems presented themselves immediately. One was that the Solr service ran out of memory very quickly. This was resolved thanks to a very helpful post on ColdFusion Muse. The other problem was that searches on the title field were now case-sensitive where they had not been before (as an aside, Verity searches — at least those using <CFSEARCH> — are case-insensitive unless the search criteria are mixed-case. For example, searching for “cancer” or “CANCER” will return the same results, but searching for “cANcEr” will not). Since I was under a deadline, I did not take the time to look into the underlying issue — instead, I used the CUSTOM1 field to store the title, while putting everything I had been jamming into the CUSTOM1 field into the TITLE field! These were fields that I wanted returned in a search, so as to avoid querying the database again, but which I did not expect to use to filter the search. So whether or not a search of that field was case-insensitive was irrelevant for my purpose — I was using it to store data, not to search. 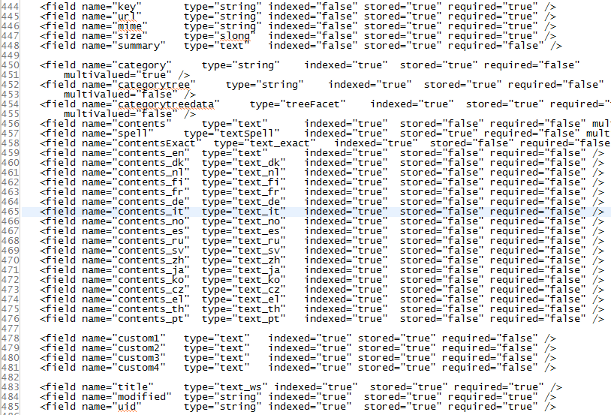 My search criteria went from this: “logic AND <CF_TITLE>fuzzy” to this: “logic +title:fuzzy”. That solution was klunky, but it worked fine. The search index was not flexible, but it worked — until I needed the flexibility. The <CFINDEX> tag is very limited. There aren’t many attributes available for custom fields (either for searching or merely for storing) — just CUSTOM1, CUSTOM2, CUSTOM3, and CUSTOM4. (Of course this is a big upgrade over versions of CF in which only two custom fields were available.) I wanted to return more than just four custom fields, so I jammed them into the CUSTOMx fields as delimited lists. This of course makes it impossible (or, at least, difficult) to filter on those custom fields; they store data and nothing more. I wish I could remember where I read this (I certainly didn’t discover it on my own — credit where credit is due), but the key to unlocking some of the power of Solr is to edit the collection’s schema, then break out of the <CFINDEX>/<CFSEARCH> paradigm and use Solr as a web service. A second question comes to mind. Can you simply add new custom fields here, in addition to custom1 .. custom4? The answer is yes. The problem then becomes one of indexing and searching. How do you index the new custom fields? and: How do you filter searches on them? Now comes the hard part — actually indexing your data. There are a couple of tools available on the internet for this, but personally I found them unacceptable for one reason or another. But I also think that it’s important to know what is going on under the hood, so to speak, in the event you need something for your search that isn’t in one of those tools. I’ll go over that in my next post.